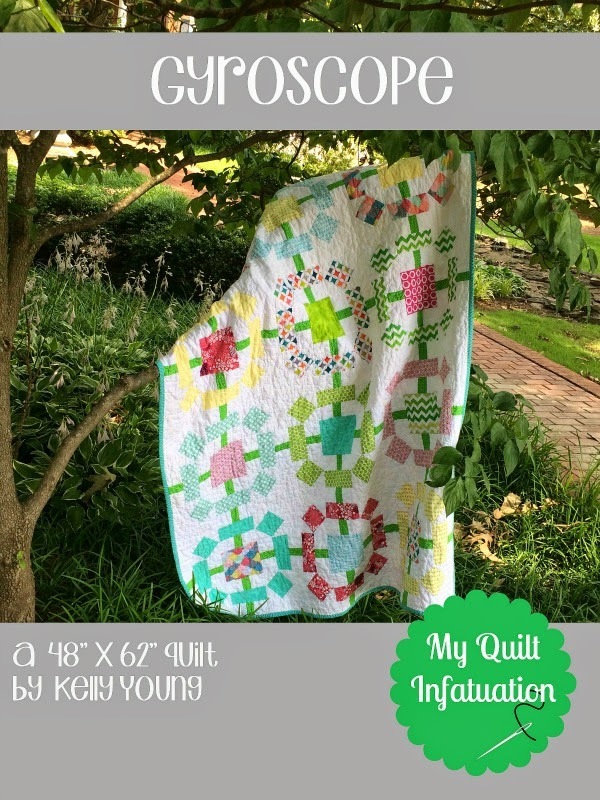 My Quilt Infatuation: Stuff is Going On! This is such a cute quilt. The colors are great. You are busy!!! I see that you've found a new photo shoot location...I'm glad I could introduce you to it. :) The Heather Bailey quilt is beautiful and will be perfect for a "big girl" bed. I can't wait to see your rainbow quilt come together! 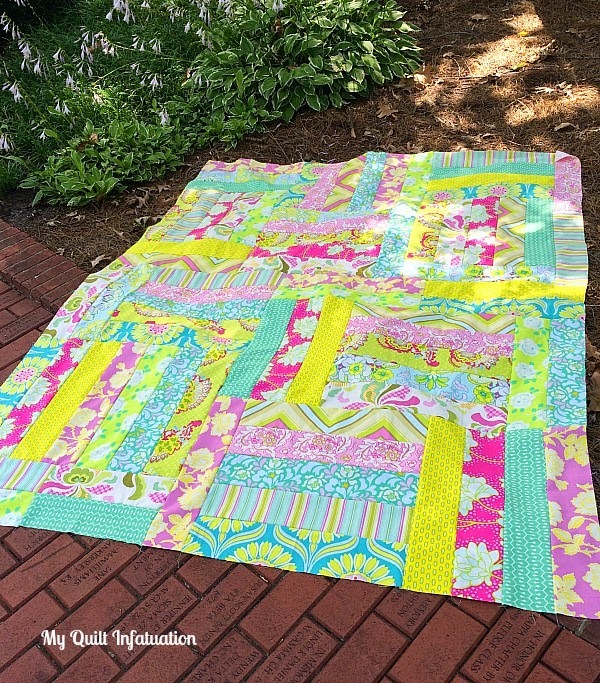 Love your blog and your quilts! Can you tell me the name of the first quilt shown today_ the commissioned one? Thanks. Thank you so much! This is a pattern that I have designed myself, and I call it Strip Tango. I'll actually be posting a tutorial for it tomorrow, so be on the lookout! l LOVE Heather Baily!! She is my new favorite designer. This quilt you are working on is just wonderful! I love the colors and the pattern. 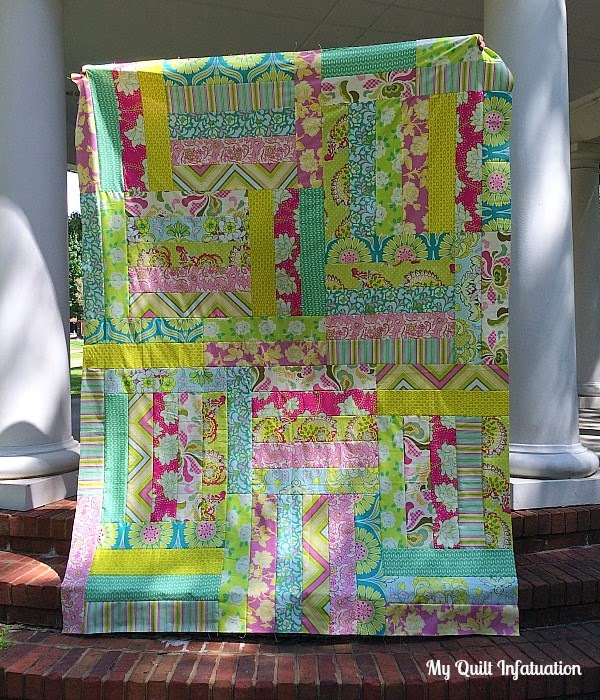 Wow, I would love to make this quilt from my Heather Baily fabrics and I need her new line too. Thank you for sharing. Your big girl quilt looks great. Love the colors and the simplicity of the pattern. Also really like your first published pattern. Congrats on that. What a sweet quilt top! Those fabrics look beautiful together! I know how you feel about having more than one project on the go. It's an odd feeling to have multiple things in the works at one time. 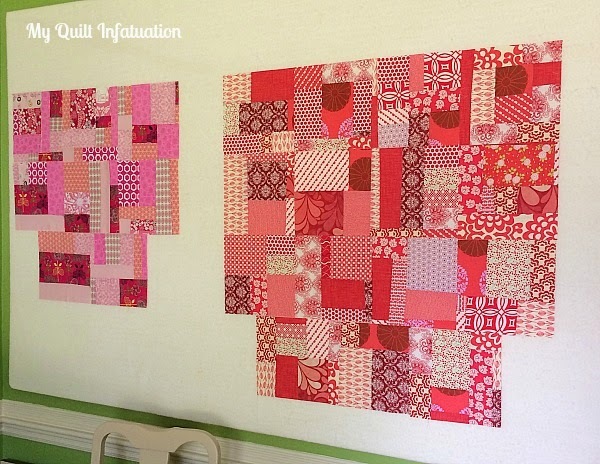 Love your playful scrap project. And congratulations on the upcoming publication, Kelly! It's another great pattern! Oh, what beautiful creations! I'm in Albuquerque with my daughter and her family. She and her husband went to Las Vegas last week and I had the two boys (3 and 8) by myself for 6 days. She's home for 4 days and then off to girls' weekend in Dallas with some sorority sisters from college. She comes home Sunday and I leave Monday. She is a high school math teacher and I was telling her about your teaching about quilts with the Underground Railroad. I told her that in my grief recovery, I am encouraged to volunteer which I am with my quilt guild and church (grief and widow's groups). I told her I'm going to see if there is a place at church to volunteer to tutor Alg I - that's my love. I am thinking about working up a quilt program around tessellations. Her uncle lost his wife about 2 years ago and he was an art professor, so we might be able to come up with a great program for children at different levels in the public schools. In the Tulsa area there are many school districts we might interest. Someone even suggested we try the public library. The students could even "make" their quilts with construction paper, depending on the class. We could work with the teachers that are teaching sewing, too. Pillows could be made. My daughter thought that would be a great idea. After all, even though I was a math major and a computer programmer, I also had an education major (not math ed). I got my masters in education and I was 2 classes and my dissertation away from my doc in gifted ed when my health issues overtook me. So, I have some skills in my depot. I love the carousel pattern. It would be easy to enlarge or decrease depending on a size requirement. I was thrilled when I saw a quilt on my 8-year old grandson's bed. It is a store bought quilt. I think grandma might be making him one. His other grandmother asked me to make her one. I've had it cut out for three years and haven't sewed a stitch on it. You know it's different when someone expects it of you. I already had it cut out when she asked me to make it for her. I told my daughter that I would make a quilt from cotton (non t-shirts) from her husband for the mother-in-law or my son-in-law. She said nothing has been given away since he died in December and basically I got the impression, they probably wouldn't be satisfied with anything I made and it wouldn't be in my best interest to try to do it for them. It has never been mentioned again. So, ... I certainly won't do it for family for $. Then I really feel they have no right to complain. If I have it professionally quilted, then I would consider letting them pay for that, but that's another matter. Hope you are enjoying your summer. I have a week planned in July with my other 8 year-old grandson, a quilt retreat with Laura Wasilowski and a quilt tour to England in August. So, I'm busy, busy, busy. Then I hope to start piecing. Love the quilts! The scrappy pinks and reds look beautiful already. Can't wait to see the finished product. The new quilt you are working on i beautiful and the scrappy rainbows look fun! Congrats on your new pattern too Kelly! Thanks for sharing! Your rainbow quilt is going to be so happy and bright. I have been thinking of doing one as well. At least start one with the colored scraps that allow. I don't have enough of all colors. Funny how we tend to lean toward certain colors. Very nice quilts!! Thank you for sharing yourself and your vibrant skills. So colorful and bright !~! I love it. I have lots of cut strips so the idea of making one similar to yours is possible for me. Something to think about--thanks for inspiration. It is a fun bright collection of fabrics, nicely done! Love the rainbow! And the commissioned quilt is fabulous! The colours are perfect for a big girl room. I love these colours! Beautiful! I love Heather Bailey's fabrics so much - Pop Garden has always been my fave- her pastels are lovely but I wish she'd go back to those BRIGHT colors again. That commissioned quilt is perfect for a young girl - I am sure it will be greatly loved.